Celebrities seem larger then life...until they die. In life, they star in movies and tv shows and own fancy mansions. They earn our right to adore them by being masterful and creative and surprising, as Williams was in all his roles. The special ones, like Williams, felt like real people when you were with them, while still casting that aura of fame. 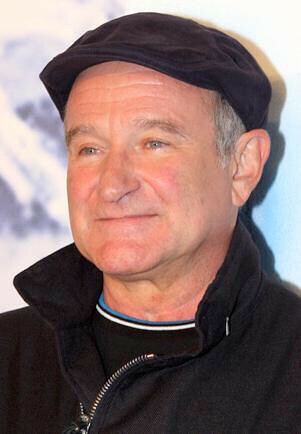 Williams supported causes, and made sad people laugh, without their knowing he may have been sadder then they were. Celebrities sign autographs and pose for photos, and at times thrill us with their humility. But they are still somehow always otherworldly...never quite attainable. In death, particularly suicide, that's when the paradox emerges. While photos and video clips chronicling the arc of their fame glut newspapers and websites, it's the little details of their ordinary lives in their final moments that get us. Their Everyman. All too often, they spent their last hours in their most vulnerable of circumstances, alone in hotel rooms, or in their houses or apartments, gorging on some horrific binge of abuse. An altered state that takes them to their final resting state. Corey Monteith, Phillip Seymour-Hoffman, and Heath Ledger, all come to mind. Suddenly, there is a change in perception. Celebrities can be alone and lonely, just like us. We understand now. Ironically, we can now envision them reading a book, or grabbing a cup of coffee, or even going to one of their own movies. If they were still alive, that is. So with death, we are left to our imaginations. What they were thinking in their final hours? What led them to take their own lives? Did they want to be lost? Did they want to be found? What were they hiding? What about their families...did they not love them enough to stay alive? The news media frenetically reconstructs the celebrity's last day, hour, week. Social media is suddenly the harbinger of darker things, as we ponder that last tweet, Instagram, and Facebook post, looking for clues. The only cliche I can think of when it comes to Robin Williams is the saddest one of all --he was a victim of his own success. Despite the cruel cycle of depression and substance abuse that haunted him, the work was what kept him going, and when it dwindled or didn't pan out, it got the better of him. But his successes may in the end have saved him from an even earlier suicide. We'll never know. In the end, as far as Williams goes, for me he'll always be the beloved "Mork from Ork," a reference so everyday otherworldly as to be sublime.